The Mini-tests contain example questions to allow everyone to become familiar with the various types of features NAPLAN Online uses. For example, elements of the online tests include interactive navigation and features such as drag and drop. There are also interaction tests, which walk students through how to interact with question types with additional supporting text, and accessible versions of the interaction tests which displays different types of questions based on adjustments that can be made for students with disability. Although each mini-test will consist of questions similar to the NAPLAN Online, they do not reflect the full functionality of the national online assessment platform, which is being refined in preparation for the move to online assessment from 2018. Transitioning to NAPLAN online assumes that schools have suitable hardware and reliable access to the internet. Some provisions will also be made for students, only where necessary, to complete the same tests on computers that do not have adequate or any internet connection. 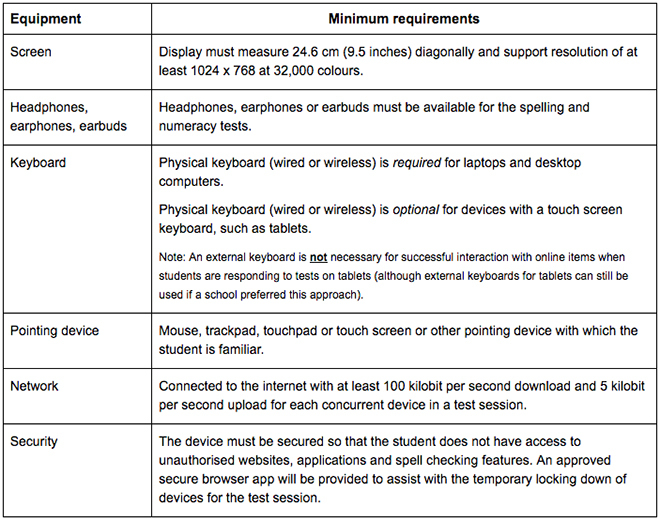 The following list includes the general requirements for NAPLAN Online when schools make the transition.